Recently there has been much comment about problems at defined benefit pension plans - how underfunded they are, how they are the "next shoe to drop" in the financial crisis. Here is an example from Leo Kolivakis posted at Naked Capitalism. Plan sponsors had two choices. They could retain the 60%-40% asset mix but fund at the minimum and run the risk of deficits in market down turns. Most of them never believed that their companies would ever go bankrupt and so they did not think they were putting their members’ financial lives at risk. Or they could invest solely in fixed income assets. This removed the asset-liability mismatch and resulting windup risk but it also meant lower long-term investment returns. Lower returns meant either increased contributions in the order of 30% or 30% lower benefits or some combination thereof. Pension plans were deliberately running asset allocation mixes of 60-40 (stocks/bonds) because it was the cheap thing to do and not for risk control (asset-liability matching) purposes. In other words, much of the problems today at DB plans were the result of past decisions. The chickens have come home to roost. I have written before that we are likely experiencing a bear market rally in equities. We have seen signs of capitulation by bears and short-sellers. William Hester of Hussman Funds concurred with this view, see his incisive analysis of volume behavior in previous rallies. Mark Hulbert is more agnostic on the rally vs. renewed bull controversy, but indicated that we will likely see a re-test of the March lows. All this debate is well and good, but why did the market continue to rise? And what is the market going to do now? As I write this fair value on S&P 500 futures is down just under 2% as news broke that the World Health Organization declared an outbreak of a previously unknown swine flu virus "a public health emergency of international concern." WHO Director-General Margaret Chan indicated the outbreak has “pandemic potential.” (For possible market effects of this illness, here are some sample bullish and bearish views). This equity rally has been characterized by leadership by Financials and low-quality, beaten up stocks, or a manifestation of the Phoenix effect. If this news panics the markets in the days to come, watch how the leadership behaves to gauge the resiliency of the rally. Which do you think is the most politically painless? Bloomberg also reports that the U.S. more than quadruples borrowing as tax revenue drops. How will they finance this debt? How will they crawl out of this debt hole? If you didn’t see it already, read the Confessions of a TARP wife in order to keep an eye on how social attitudes change. I reiterate my offer: I have begun a longer email list for inflation bulls. There is no cost and I will keep your email address to myself. Drop me a line and sign up here. The latest Zero Hedge post indicates that there has been significant negative performance by quant funds, driven by a rally in low-quality stocks, which is a manifestation of the Phoenix effect (see my latest update on Phoenix here). Both charts show the same pattern. While quant funds have experienced negative performance recently, they are nowhere near the drawdowns seen in August 2007. ...initiated by the rapid unwind of one or more sizable quantitative equity market-neutral portfolios…likely the result of a forced liquidation by a multi-strategy fund or proprietary-trading desk. In other words, quants were in a crowded trade and someone wanted to get out really fast. The system seized up and suffered a “heart attack” as a result. As the liquidity pressure eased, performance gradually came back to “normal”. Today, the source of negative performance was largely attributable to the Phoenix effect. The Phoenix effect is not as sudden as the heart attack liquidity effect seen in August 2007. However, it can be longer lasting and can be like a cancer as it eats away at performance. I recall that Jeff deGraaf reported in late 2003 that the return spread between the lowest and highest decile of stock price was about 70% - an astounding return to a factor for less than one year. Quant processes work but they don't work all the time. Quant equity managers need to prepare for these negative environments in different ways. In the case of August 2007, they need to seek out new sources of alpha that are uncorrelated with their current alphas, which is easier said than done. In the case of the Phoenix effect, the recent bout of negative performance could be just a taste of what investors could see in the next 6-12 months. This is another example of how quant managers need to think hard about the assumptions behind their models and adjust their positions accordingly in order to survive and prosper as a quant. I have written about seeing signs of stabilization for the last few months (see examples here and here) but my comments were met with great disbelief at the time. Others like Scott Grannis who blogs as Calafin Beach Pundit have said the same thing for longer. It is gratifying to see that the equity market has finally turned to the viewpoint that things aren’t getting worse and rallying as a result. My reaction to the rally is - not so fast! Right now, the latest readings are stabilizing at very low levels, but they have not begun to improve. Looking at other “real-time” indicators like the Baltic Dry Index and commodity prices, they have recovered from serious drubbings seen in the last year but have begun to retreat from their recent rallies and about half of the gains from the trough. These are not signs of a robust recovery. The recent rally has brought out many bulls as they sounded the “all-clear” signal. With the financial leadership in this rally at extremely overbought levels and signs that bears are in the final stages of capitulation, investor sentiment is nearing bullish extremes. As the AAII sentiment survey shows, bullish sentiment are at levels consistent with the top of recent bear market rallies. At present, the advance we've seen over the past several weeks is looking increasingly speculative. We certainly cannot rule out a further advance, but the basis for expecting one is currently weak. Better internals, higher quality leadership, broader sponsorship, and needless to say, a credible foreclosure abatement plan, would all be helpful "legs" if this advance is to be durable. For now, we don't observe enough of that evidence. I reiterate my belief that long-term investors should be dollar-averaging into equities over the next few months. For traders, I would be highly cautious about committing new funds to the long side over the short term. Remember how Microsoft used its power during the Tech Bubble to grind down competitors? Remember what it did in spreadsheets, browsers, etc.? As a result, newer tech companies (e.g. Google) have adopted the "don't be evil" motto. Has Goldman Sachs become the Microsoft of today? See Barry Ritholz's comment (among others) on how GS is suing the blogger www.goldmansachs666.com for critizing Goldman. The inflation vs. deflation call may well be the call of the decade for investment policy. On one side are the inflationists, who argue that all this fiscal and monetary stimulus is bound to create inflationary pressures once the world economy begins to recover. On the other side are the deflationists, who argue that the de-leveraging process has unleashed powerful deflationary forces. There may be a Third Way out of this debate – and that Third Way is even more scary than either of the scenarios contemplated by the two factions. Do you believe Warren Buffett? I can assure you that monetary policy makers are fully committed to acting as needed to withdraw on a timely basis the extraordinary support now being provided to the economy, and we are confident in our ability to do so. Avner Mandelman of Giraffe Capital suggested that the Obama Administration is positioning Paul Volcker in the wings for a liquidity mop-up once the financial crisis is over. It is unclear, however, how much political will there is to take the pain once it is clear that an economic recovery has begun. When I went to school back in the Dark Ages, math classes had a technique of “proof by counterexample”. Conventional wisdom holds that all this stimulus is going to result in inflation some time down the road. Japan is the proof by counterexample. During the Lost Decade, the Japanese government spent like crazy and the BoJ adopted a policy of quantitative easing. Debt to GDP ballooned. The government built roads to nowhere. Yet the economy didn’t recover. One of the leaders of this deflationist movement is Richard Koo, whose webcast is long but well worth watching. He argues that as long as government spending displaces consumer spending (because consumers are saving and not spending), there will be no inflation. The appropriate policy in this case, according to Koo, is for government to spend until it hurts and spend some more. The Third Way: Down the hyperinflation road? Johnson’s contention is unless the government of the day is willing to take on the entrenched elites and force them to take the pain, the path of least resistance is rising inflation and possibly hyperinflation. Certainly America’s elites have enjoyed some very good times. William Hester of Hussman Funds has documented the elevated levels of profit margins in this past economic cycle, which indicates the bulk of the gains were tilted towards the suppliers of capital, as opposed to the suppliers of labor. The classic measure of income inequality is the Gini coefficient. High Gini coefficients for the U.S. is well documented. In of itself, this is not necessarily a bad thing as high gaps between rich and poor could serve as a strong incentive for wealth creation. However, an OECD study also showed low social mobility in the U.S., as defined by the correlation of the Gini coefficient of parent and offspring, compared to more “egalitarian” countries like Denmark and Norway. High Gini coefficients combined with low social mobility indicates that elites are entrenched and the American Dream is only a dream. Wall Street has become the new elite. Stephen Roach warned of reviving the Debt Frankenstein to revive America, which only would only serve to stretch the current economic imbalances. This appears to be the consensus of policy makers around the world and lead us down the Third Way hyperinflation path. Such a path would likely result in an era of rising inflationary expectations, to be followed by a deflationary collapse. Do the tax protests gain any traction? Recently there were calls for “teabag” tax revolt protests. I interpret these as a backlash from the Establishment elite to try to retain power. Redressing either the Horatio Alger style opportunity implicit in the American Dream through high social mobility or redressing the level of Gini coefficients in the U.S. are signs that the elites are losing power. Other signs to watch for: do conservative commentators like Larry Kudlow gain or lose followers? Do any American politicians say the S-word? The willingness of Americans to change their attitudes will be another important milestone in the road to restructuring and reform. For many years Americans have been conditioned to get something for nothing. American were content to trade U.S. debt for cheap Chinese goods. Not once did George W. Bush mention the word “sacrifice” when he began the Global War on Terror. Today, the U.S. faces trillion dollar deficits and Barack Obama is not preparing the country for the tax hikes (remember the “sacrifice” word) to come. One commentator went even further and suggested that this will doom his second term. What happens to inflationary expectations? Watch the pricing of TIPS and inflation swaps. The current picture is inflationary expectations dropped late last year and they are now on an upswing. Levels, however, are not as elevated as they were a year ago. At this point, my base case is inflation and a repeat of the 1970s sideways market in equities. However, I am watching these indicators carefully and I am willing to be persuaded otherwise. If you are interested, I have begun a longer email list for inflation bulls. There is no cost and I will keep your email address to myself. Drop me a line and sign up here. Here is another in a series by guest blogger Cox Owen on hedge fund operational due diligence. Even though hedge fund returns appear to have stabilized and appear to be flat to slightly up on a YTD basis, OPDD remains a part critical part of the investment process for hedge fund investors. OPDD is titanic. As in my previous post I will only be able to discuss a brief portion of this material due to its enormity. OPDD requires an eye for detail. More importantly it requires, at a minimal, a general understanding of the investment philosophies. You must be able to understand the investment concepts in order to understand the operational flows. How can anyone claim to verify that the operational flows are correct if they do not understand the investment concept? There are institutional investors who have little faith in quantitative models (that rely on the market to move) and are convinced that active fundamental managers add more value to their investment philosophy. On the other side of the coin, there are other institutional investors who have a significant portion of AUM allocated to quantitative models. To truly understand the operational flows and complexities of these strategies and other highbred strategies we must have an acumen for the investment concept. Let’s take a closer look for the sake of clarity. Please understand that this is only a small percentage of OPDD used to illustrate specific examples. There are many ways to invest in distressed organizations. From an OPDD perspective we must be able to understand the general investment concepts. Under Chapter 7 (liquidation procedures) the doors are closing and the assets are being sold. Under Chapter 11 (reorganization) bankruptcy courts restructure the financial obligations of the firm. So now we know that the manager being considered must have at least a bankruptcy lawyer with an in-depth knowledge of the U.S. bankruptcy code , specifically within restructuring or liquidation . This is certainly someone we want to do a background check on . There is clearly much more to the OPDD of a distressed shop than just the lawyer, but it is a good example of where to start when you are differentiating between strategies. ( It is also worth noting that all European bankruptcies are liquidations). We must also understand all of the debt and equity securities of the firm, that lead to “Absolute Priority “– the order in which securities are paid. As I mentioned earlier, there are many ways to invest in distressed organizations, purchasing senior debt in a liquidation at $0.10 on the $1.00 hoping to receive $0.30 on the $1.00 when the trustee sells the company’s assets is sensible, as does purchasing subordinated debt or equity at a discount during a restructuring hoping to profit from the turnaround of the reorganization. I use this as an example because it could certainly be a red flag if while you were reviewing held securities as part of the OPDD process you noticed the purchase of subordinated debt (during a liquidation) as part of the funds holdings. The bottom line – the more you know about the investment philosophy the better you can connect the dots between the operational side and the investment side. Also known as risk arbitrage, this strategy has a fairly straight forward concept that can become very complex when third parties and government agencies become involved. The primary concerns for managers are whether or not the deal is approved and how long it takes to close. For the sake of this conversation we will discuss the two types of companies. Typically they are referred to as the target firm and the acquiring firm. The usual concept here is to short the acquiring firm and purchase the target firm. So how does this influence us from an operational aspect? If while we are conducting OPDD we notice shares of companies in the fund that are not part of a merger arbitrage transaction we should absolutely question those shares. Generally we will only see equities in these types of strategies, so if we find options in the fund this should also raise some questions. Options can be used in collared mergers, this is exactly why it is important for operational staff to have a general understanding of the investment concepts. As an aside: We are making the assumption that we get to view trades in the portfolio. Many large institutional investors require 100% transparency, and in the current environment we could possibly see complete transparency as an industry standard. That is why we sign the Non-Disclosure Agreements. I was speaking with a friend who is lawyer for a public pension fund and we were discussing the “Public Records Act “ that many states must follow, (any information given to public pension funds must be made available to the general public )and the Hedge Fund Transparency Act of 2009 (which could be passed as early as September 2009 with examination beginning in March 2010) to see how disclosure and transparency will evolve. We concluded that we need to see how the final draft of the HFTA reads. In the mean time some hedge funds may wish to redact brokerage statements to conceal positions from leaking to competitors. Companies can sell divisions for almost any reason. Hedge funds often follow these transactions (sometimes not completely at arm’s length) because the divisions that were sold will commonly have managers within these divisions having an ownership stake and are intensely driven to advance performance. How does this have an impact on operational due diligence? If the investment philosophy of the fund is to invest only in large capitalization companies the newly formed spin-off should not be held in the portfolio. Let’s say the portfolio manager decides to hold the spin-off because he or she believes it to be profitable. This type of style drift can be uncovered by proper OPDD and a general understanding of the investment philosophy. There are many ways to invest in trend following CTA’s/ CPO’s. First we must understand the difference between a commodity trading advisor and a commodity pool operator. The CTA is setup to trade managed accounts and CPO’s are setup to trade fund accounts. We should know this from an operational perspective because as an investor we might not want to me a member of the fund and wish to avoid the expenses that funds incur (auditing fees, fund administration fees, legal fees, etc). In general, technical trading recommendations may be based on computer-generated signals, chart interpretation, mathematical measurements or a combination of such items. So when you are conducting your OPDD you want to ask questions about their data and much more. If you notice a long trade that was made during a downward trend this is almost always a red flag and should be questioned, it could be a trading error, it could be a reversal or something else. If the offering documentation says that the fund will trade liquid futures yet they require 6 months notice for redemptions due to liquidity this is clearly a contradiction and should be investigated. Once again, these are just 2 examples of many for trend followers and how an understanding of the investment concept can prevent operational disaster and also detect fraud. Market neutral strategies(also referred to as pairs trading), like many other strategies ,can come in a plethora of flavors using a variety of statistical methods. Some market neutral strategies will use technical analysis (price & volume data) others market neutral strategies can use fundamental analysis (financial statement data & other economic related data) . Some market neutral strategies are dollar neutral others are not , some are sector neutral others are not. Generally speaking, market neutral strategies usually have long and short equity positions (this is not always the case because of the numerous variations within the strategy and many hedging possibilities). The market neutral strategies prove the point of understanding the investment concept and its relationship to OPDD very well. If your due diligence personnel are simply verifying that there are equity trades in the fund, this could be essentially any type of equity strategy. You could have thought your participation was with a market neutral fund, your investment personnel could have done thorough investment analysis, but if your operational staff does not know how to tie out the trades to the investment strategy you could be participating in something other than what you agreed to. You could find options, equities, futures and indices in the fund, however if you don’t understand the strategy how do you know if these securities belong to this fund or not? This could be the sign of a rogue trader, style drift, fraud or any number deviations from the agreed investment concept. On the reverse side these options, equities, futures and indices could be part of the strategy. It seems like every other day another fraudulent fund or Ponzi scheme is uncovered. Now more than ever we need the SEC to drastically improve its investigative knowledge and manpower. We have all heard the stories about Madoff being handed to the SEC on a silver platter and some have commented that the investigators were either conflicted (in hopes of landing a job with Bernie) and others have argued that they were incompetent. In any scenario, we need to insure that this never happens again. Maybe it would help to have the states attorney general offices also develop investigative teams that would provide another layer of protection. Here is another example of an alleged fraudster that got off the hook after being exposed 4 years ago. In 2005, two Venezuelans alleged in U.S. District Court in Florida that Stanford International Bank "knowingly aided and abetted ... a classic Ponzi scheme" targeting current and former residents of Venezuela. In 2006, former Stanford employee Lawrence J. DeMaria filed suit against Stanford in Florida state court. He alleged that the firm "was operating a 'Ponzi' or pyramid scheme, taking new money to its offshore bank, laundering the money and using the money to finance its growing brokerage business, which did not have any profits of its own." Well I hope you enjoyed the read and I want to thank all of you for e-mails and your replies to these posts. If I can help in any way certainly feel free to drop me a line or two. I began Humble Student of the Markets as a way of putting down my thoughts on the markets, quant funds, investment processes and hedge funds. These are only my thoughts and I have no other agenda. The audience for those topics can be somewhat divergent and topics that interest one group may not be of interest to others. Long time readers know that I remain a long-term commodity bull, although I am at odds with a number of gold bugs because gold is not a religion for me. I am experimenting with writing longer pieces on commodity trends on a weekly basis that are really too long to be posted here. I will be emailing them to a number of contacts that I know and it is free. If you would like to get on the email list please drop me a line at cam at hbhinvestments.com. I promise that I will keep your email address to myself and won’t give, sell or rent your email away to anyone. The first post will be entitled An investment for the gold bull daredevil, to be sent out this weekend. Time to prepare for volatile volatility? With the S&P 500 rallying and the VIX Index on the verge of breaking technical support, which way is volatility like to go? Bill Luby at VIX and More says that the VIX could be regarded as either high or low, depending on the time frame. How fat are the near-term tails? [T]he Volume Weighted Average Price of the SPY index indicates that the bulk of the upswing has been done through low volume buying on the margin and from overnight gaps in afterhours market trading. The VWAP of the SPY through yesterday indicated that the real price of the S&P 500 would be roughly 60 points lower, or about 782, if the low volume marginal transactions had been netted out. This is very intriguing analysis. If Durden is right, then is it time to buy volatility? Remember Peter Lynch? He skippered Fidelity Magellan (FMAGX) during the 1977-1990 period and took the obscure fund to fame. The fund beat the S&P 500 in 11 of those 13 years. Since his departure, FMAGX has gone to a number of managers. The latest steward of the fund is Harry Lange, who has been in charge since late 2005. FMAGX has had its troubles as it sported a spotty record in the last few years. Morningstar rates this large cap growth fund with only two stars. In 2009, however, we saw a spectacular turnaround. The fund is up 6.6% YTD to April 9, or 11% ahead of the S&P 500. Lange appeared to have achieved these returns with a combination of bets on emerging markets, interest rates and good stock picking. When I reverse engineered FMAGX’s macro exposures, the turnaround in performance was surprising as portfolio manager Lange was aggressive in his market beta, or market timing bet. As the chart below shows, FMAGX moved to an aggressive stance on the market in the late summer of 2008 and cranked up that exposure as the market tanked. The right kind of market exposure? Stock selection was also a standout. A glance at the top holdings of FMAGX shows the top holding to be Corning Inc (GLW), which occupied 7.6% of the portfolio and was up an astounding 59% YTD. In fact, only five of the top 25 holdings showed negative returns YTD. Given the large number of holdings in this portfolio (218), the fund appears to make big stock bets, as evidenced by the large (7.6%) position in the top holding. Such a profile is suggestive that stock selection will dominate returns over the macro positioning of the fund. We’ll have to watch and see if the turnaround continues. Gold has had a nice run in the last few months but as the chart below shows the yellow metal seems to have faltered lately. One indicator I like to watch is the ratio of the CBOE Gold Index (GOX) to the PHLX Gold & Silver Index (XAU). GOX is an equal weighted index, which means that the more speculative and smaller capitalization names have greater weight in the index. By contrast, XAU is a capitalization weighted index, which means that the larger capitalization stocks have greater weight. The performance of the GOX to XAU ratio is a measure of the degree of speculation in gold stocks. As the chart of the ratio shows, the small caps have been in a steady uptrend against the large caps since August 2008, which indicates rising speculative sentiment. With the downturn in the gold market, the ratio came down to test the uptrend line. So far, the test has been successful. The continued existence of this relative uptrend could be a positive divergence for the gold market. 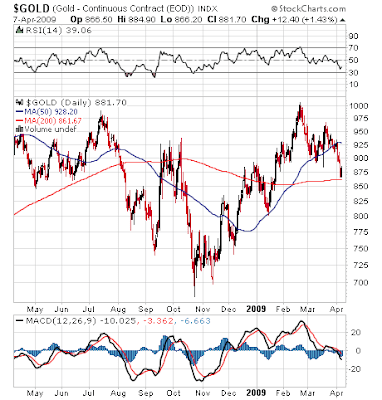 Investors should watch this space as a key indicator of the health of the gold market. A continuation of the relative uptrend is an indication that there is speculative sentiment still holds the upper hand and this is just a pause in the gold bull. I would prefer not to anticipate how the readings on indicators turn out. If I were forced to make a call, I would lean towards being a gold bull. My reasoning is other indicators of inflationary expectations such as the inflation swap rates are continuing to rise. Ken Heebner’s CGM Focus Fund has had a superb long term record, but this year Heebner has been struggling. The fund is -13.7% to April 6 YTD, which is 6.9% behind the S&P 500. When I reverse engineer Heebner’s macro exposures, it seems that he got bullish too early and is now in the process of reversing course. As an example, the chart below shows his beta exposure to the S&P 500. He raised his market exposure early and as the market tanked he pulled back, just in time for the bear market rally. Ken Heebner has a bottom-up driven investment process but takes big macro bets as a result of his bottom-up analysis. This style can work well when the economy is showing a trend, but I believe that Heebner tried to call the turning point a little early and got hurt. I wrote before that trend following CTAs are also struggling as the macro backdrop is trying to find its footing as the economy stabilizes. However, stabilization is not equal an upturn and a bull market revival is not yet in sight. In a nutshell, that may be Heebner’s problem. In a future post, I will highlight a venerable old fund that is showing signs of revival. Brandywine Realty Trust (BDN), CapitalSource Inc (CSE), CBL & Associates Properties Inc (CBL), Century Aluminum Co (CENX), Citizens Republic Bancorp Inc (CRBC), Colonial Properties Trust (CLP), Complete Production Services Inc (CPX), Conseco Inc (CNO), Delta Petroleum Corp (DPTR), Developers Diversified Realty Corp (DDR), Domtar Corp (UFS), First Industrial Realty Trust Inc (FR), First Marblehead Corp/The (FMD), Furniture Brands International Inc (FBN), Gannett Co Inc (GCI), Genworth Financial Inc (GNW), Hercules Offshore Inc (HERO), Hovnanian Enterprises Inc (HOV), Huntsman Corp (HUN), ION Geophysical Corp (IO), iStar Financial Inc (SFI), Liz Claiborne Inc (LIZ), Manitowoc Co Inc/The (MTW), MCG Capital Corp (MCGC), MGIC Investment Corp (MTG), MGM Mirage (MGM), Pacific Sunwear Of California (PSUN), Patriot Coal Corp (PCX), Pennsylvania Real Estate Investment Trus (PEI), Petroquest Energy Inc (PQ), Popular Inc (BPOP), Quiksilver Inc (ZQK), Rex Energy Corp (REXX), Saks Inc (SKS), Sterling Financial Corp/WA (STSA), Sunstone Hotel Investors Inc (SHO), THQ Inc (THQI), Webster Financial Corp (WBS) and Zale Corp (ZLC). The portion showing the bottoming pattern is largely unchanged from my last update, which had 43% of the list showing this pattern. Given these readings and the fact that the major market averages appear to be overbought, my best guess is that we are witnessing a bear market rally that is on its last legs. I would be very cautious about committing funds to a Phoenix strategy in the short term. OK, April Fools is over for another year. Back to business. I have lived in both Canada and the U.S. for considerable amounts of time and some of the cultural differences continue to fascinate me. For example, a major Canadian newspaper is trumpeting how Canadian banks have largely escaped the worst effects the global financial tsunami. Before Canadian continue on their victory lap, I would just like to point out that Canadian financial institutions escaped because Canada has a low-beta culture. * Serve as principal financial liaison with legal counsel to ensure all contracts and agreements are prepared in accordance with financial goals and standards. * Design and implementation of all systems and reports used in developing financial strategies. * Develop methods of cost allocation for management reporting on product line and geographical basis. * Present recommended solutions and alternatives to client management based on analysis of trends, profitability, and growth opportunities. * Evaluate industry developments, market conditions, and economic news to determine financial and business impact. Conduct in-depth industry benchmarking, company and market trend research, peer analysis, and market penetration modeling. Coordinate ad hoc analysis and management reports. * Bachelors in Accounting or Finance required. MBA/CPA or Masters Degree in Finance preferred. * Minimum 15 years experience with at least eight years in a finance role supporting a business unit with full P&L responsibility. * Prior brokerage industry experience required. NASD Series 27 licensing required. * Must have experience partnering with business unit leaders, developing strategic plans and leading the business and finance activities of a high revenue growth business in its early stages including new products. * Strong leadership presence and negotiation skills required. * Excellent quantitative, financial and analytical skills. * Strong written and interpersonal communication skills are essential. * Strong organizational skills and ability to prioritize multiple tasks are required. Canadians like order. An accounting designation is a form of order. The Canadian consensus was built on Peace, Order and Good Government, which are low-beta activities. America was built on Life, Liberty and the Pursuit of Happiness, which are higher beta activities. Neither is right or wrong. We just happen to be in a period where low beta is dominant. As we approach the G20 summit and America faces a decline in status during this global financial crisis, I would like to offer a modest proposal to restore America’s prestige and power. The critics have it all wrong. It’s not all about AIG or Goldman Sachs. It’s not all about the financial system. It's not about GM or Chrysler. Go back to the writings of Michael Porter and consider what are America’s competitive advantages? The world’s foremost military, having a roughly 50% of total world military spending. What is America’s problem? It’s deflation and the specter of unemployment. Given American pre-eminence in military matters, she can leverage that advantage by invading a populous emerging market country and then forcing everyone at gunpoint to buy American cars. There is one problem, though. As demonstrated by the Iraqi adventure, the U.S. Army has become too high tech and didn’t have enough boots on the ground. The solution is to bring back the draft, which will have the additional benefit of soaking up pockets of U.S. unemployment. During the 19th Century, Europeans relied on their colonies as captive markets for their industrial output. Why can’t America today? America's leaders need to learn to think outside the box.